Getting locked out of your home or your vehicle can be very annoying. Not only does it put a halt on your plans for the day or the night, but you’re also going to have to figure out how to get back in pretty quickly. Many people have opted to keep spare keys in secret hiding places to avoid having to call a 24 hour locksmith to open the vehicle or the home. While spare keys are a great idea, it’s important that you hide the keys in the best spot to avoid someone from breaking into your home or losing the spare. At Pro-Lock & Safe, we strongly encourage you to have a spare key for your home, but today we’ll be going over the best and the worst places to hide a spare key. After all, you want to avoid a mishap by putting your spare key in the best place possible. If you do find yourself locked out and you don’t have a spare key, then we recommend contacting our 24 hour locksmith, Pro-Lock & Safe. In movies and TV shows, they always depict someone grabbing a spare key from a flower pot or a fake rock — we’ll get into this more later — however in real life, it can be in your best interest to get a little creative. You’ll want to put your spare key somewhere that you’ll remember, but isn’t obvious to others. Many times burglars will enter the home through the front door, which makes putting your key there a less than ideal decision. You’ll want to avoid putting a spare key anywhere near your front door, so you can feel safe in your home or when you’re accidentally locked out. These are some of the best places to hide a spare key and while you don’t have to follow them to a tee, we do recommend not putting the key near your front door or somewhere a burglar may think of. With A Neighbor Your Trust: If you trust your neighbors, then this is always a good idea. When we say trust your neighbors, we mean that you have a good relationship with them and you know they won’t enter your home when you’re not there. Many people these days don’t know their neighbors, so having one you trust can be so beneficial, especially when it comes to your safety. Under A Dog House: If you have a dog, this is a great one. Not only will burglars stay away from dogs because they are loud and territorial, but it can be hard to find it in the dark of the night or even during the day if you don’t know to look there. Inside A Fake Sprinkler: Instead of the fake rock or in the flower pot, a fake sprinkler can be a great idea. The fake sprinkler is indistinguishable from real ones and it easily blends, so you know that it’s there, but others may not. In A Magnetized Lock Box Under Your Vehicle: A magnetized lock box under your car can be a great idea because a burglar won’t be able to get in and you’ll always have a spare key on you because where your car is, generally you are as well. Inside Vinyl Sliding: This is a little more unconventional, but putting a spare key inside vinyl sliding can be a great way to stay safe and be innovative. You can put a hook on the loop of the key and attach it to the lip of the bottom-most siding. Now, onto the five worst places to hide a spare key. While these places may seem like a good idea, they’ve been done again and again, so burglars know what to look for. Additionally, as aforementioned, you’ll want to avoid putting a spare key near your front door and 90 percent of these are near the front door. 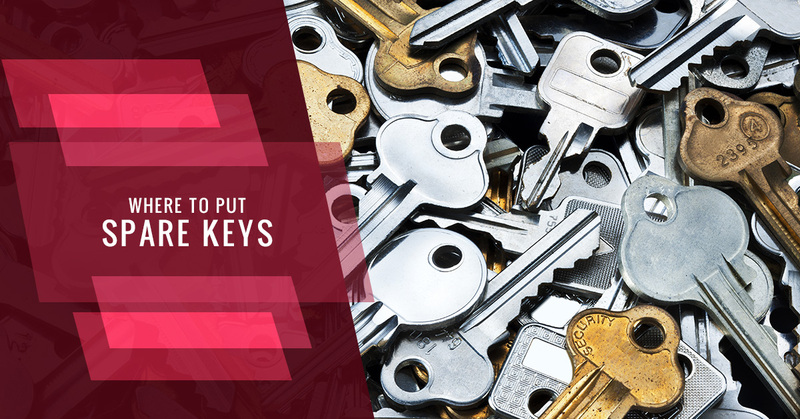 If you have a spare key in these areas, then move it to avoid unsafe situations. Your Wallet: it can easily fall out and if you lose your wallet or it’s stolen, then the thief will have hit the jackpot because now they can get into your home. Inside A Fake Rock: A fake rock is obvious that it’s fake and it can be the first place a robber looks. Additionally, the key can easily get lost if you kick it or someone thinks it’s a real rock and gets rid of it. Under A Flower Pot Near The Front Door: Everyone knows to keep their spare key under or in a flower pot. It can be the first place someone looks when they want to get into your home. Under The Welcome Mat: The small lump on your welcome mat is a dead give away that a spare key is under there. Like the flower pot, it can be the first place someone looks when they want to get into your home. Inside Your Mailbox: Your mail-person is constantly going in and out of your mailbox, so wouldn’t it be best to keep your key safe without someone shoving mail in the area and opening it once a day? We hope these tips helped to hide your spare key! Keep in mind, if you are locked out of your residence, business, or car, we can help! Just contact us to stay safe!